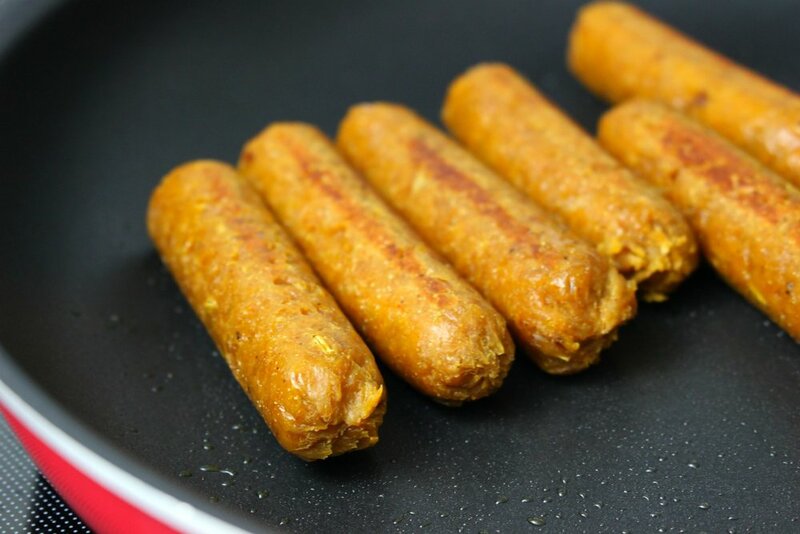 These vegan breakfast sausages are smokey, sweet and savory and can be eaten as-is, or ground and used in dishes like bolognese, chili or tacos. You can also use these proportions as a guideline to make different flavors of sausage. The key ingredient in this recipe is textured vegetable protein (TVP). It's defatted soy, so it's exceptionally high in protein and low in fat. It also happens to be very cost-effective, and can be found online or at most health food stores. When rehydrated, it has a chewy texture that mimics that of ground meat. I recommend using a beef-flavored vegetable broth for the most convincing flavor, such as these Not-Beef bouillon cubes or Better than Bouillon no-beef flavor. We bind our seasoned tvp with a combination of chickpea flour (which adds more protein and fiber) and vital wheat gluten, which firms up the sausage and gives it an even meatier texture. If you are gluten-intolerant, you can simply add more flour and expect a slightly less firm result. Bring vegetable broth to a boil. Pour over tvp, cover and allow to soak until absorbed, 2-3 minutes. Stir maple syrup, liquid aminos and liquid smoke into tvp mixture. In a separate bowl, whisk together all dry ingredients. Add wet mixture and combine. Knead for 3-5 minutes. For small sausages, divide into 12-15 portions and roll into logs or patties. Alternatively, divide into two large logs. Wrap each portion tightly in cheesecloth or aluminum foil. Bring an inch of water to a boil in a Dutch oven or wide pot. Arrange sausages on steamer insert, cover and steam for 30 minutes for small sausages, or 1 hour for larger logs. Add more water to the bottom of the pot as necessary. If desired, brown sausages in a skillet with a little bit of oil before serving.